One of the many perks but also responsibilities that comes with being on top of the mobile food chain is catering to all sorts of colorful and niche markets. One such niche is clamshell device that the Korean giant still develops mainly for its home and other neighboring Asian markets. Even though it runs Android, the tactile feel of the keyboard and answering a call with a flip of the wrist still hold a lot of appeal in a sea of bland slate-style smartphones. 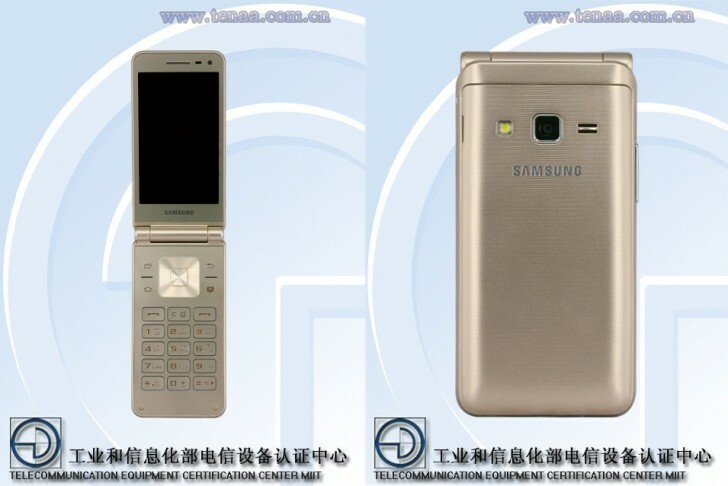 The latest such device to roam the the rumor mill is the Galaxy Folder 2 – a clear successor to the originalGalaxy Folder from last year. After getting its Bluetooth certification and popping up in documents from Zauba and the FCC, the flip smartphone can now be found on the TENAA website as well, bringing it one step closer to a release. The SM-G1600 measures 122 x 60.2 x 15.5mm with a weight of 155 grams and appears to have a 3.8-inch touchscreen display, just like its predecessor and with the same 480×800 pixels resolution as well. The phone is powered by an unknown quad-core Snapdragon SoC, clocked at 1.4 GHz, along with 2GB of RAM and 16GB of expandable storage. It is also said to feature an 8MP rear unit and a 5MP front shooter and the whole thing is powered by a 1950 mAh battery. But probably best of all, just like with the original Galaxy Folder, prospective buyers don’t have to sacrifice functionality for looks, as the Folder 2 runs on the current Android 6.0.1 Marshmallow OS with all the customization and app power that comes with it.